IIRC, the In-N-Out location was in Henderson near the Ethel M's "factory", which by the way has a neat Xmas display where they string lights through the cactus garden for nightime viewing. I also just got back from my Memorial Weekend trip to Vegas. Thankfully, I read up on places to eat through this thread before heading out there, so thank you for all your suggestions. By the way, this is my official first post on LTH. I am turkob's wife and have known about lth, but haven't actually written anything until now. I've included only pictures that came out well. First day I was there we went to Restaurant Guy Savoy in Caesar's Palace. They have several tasting menus to choose from as well as an ala carte menu, but you will get a lot of extra free courses. Plus all you can eat bread from their bread cart (i counted at least 8 different kinds) and all you can eat dessert from the dessert cart. Their 10 course tasting menu is called the Prestige and is $290. Their 6 course menu is called the Elegance, and it's $190. They have a special deal if your reservation falls between 5:30 and 6:15 called the pre-theatre menu. 3 courses for $98, which is what I did. You can choose from 1-3 choices for your appetizer and entree. There were three amuse bouche - foie gras with truffle on country bread, a black pepper parmesan waffle, and a carrot soup with a crab salad. The centerpiece was a rosemary juniper fugras. 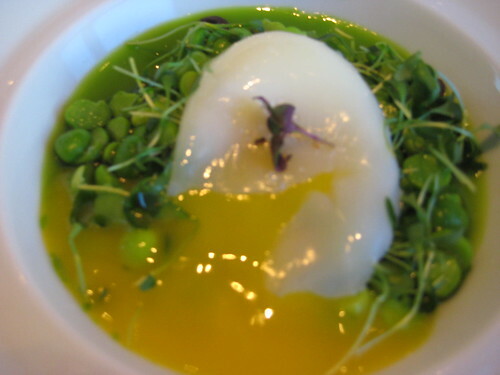 I chose the Peas All Around for my appetizer, whihc was pea gelee, peas, pea sprouts with a poached egg on top served with toasted country bread with chive oil. My friend chose the other appetizer - salmon with sugar and salt, breaded parsley on a vinegarette salad. 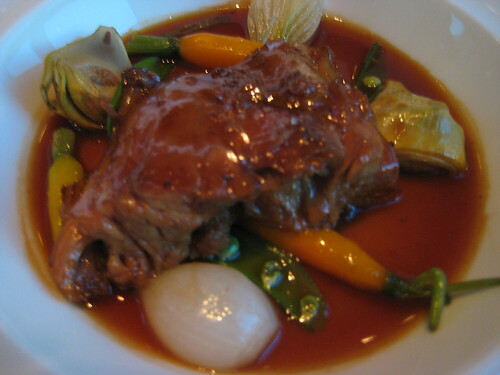 For our entrees, we both got the braised veal shank with spring vegetables. This dish is supposedly only available for 90 days. The dessert was called "Fruit" on the menu, but it was coconut done 6 ways - tapioca, chunks of coconut, foam, ice sheets, toasted crunchies, and one other one. All in all, the meal was elegant, service was very good, and pacing was on the money. My peas dish was very fresh tasting. The veal shank was good, but it was probably as good as any braised beef dish from a place like sweets and savories. The coconut dessert was light. I pretty much filled up on the bread and the dessert cart. 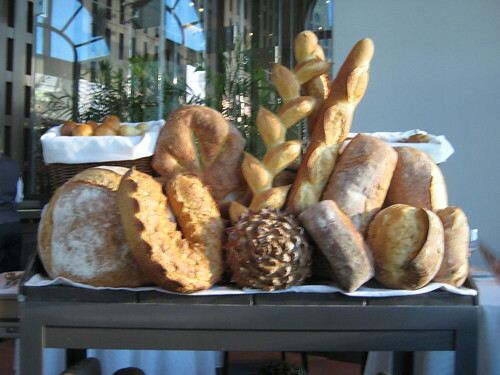 My favorite bread they had was a seaweed bread and the apple skins from the dessert cart were crisp and sweet. I left the restaurant very full, even with just "3" courses. On the way out, they gave us house made candies - pistachio chocolate, a hard candy, and a caramel. Another place we went was the Peppermill. HUGE portions, as others have pointed out, and probably the best hash browns I've ever had. Perfectly crunchy and brown with a strong butter flavor. I ordered the biscuits and gravy as well, and for $7.95, they gave me 6 biscuits swimming in gravy. I was in gravy heaven. Based on all the posts here, i had to go to Lotus of Siam. They had quite a large menu of stuff you can't get anywhere. Two pages of Northern Thai specialties and another page of Lotus of Siam specials. I would say that this reminded me of Spoon Thai's specialties, there was just a lot more of them available. We ordered Nua sao renu - charbroiled beef with tamarind and fried dry chili, Fried Pompano Fish, Khao Soi - northern Thai egg noodle in a coconut based curry sauce with pickled vegetables, and Thum ka noon - pounded young Jack fruit, shredded ground pork, and tomato. The Thum ka noon was probably the most unique, but I didn't really taste the Jack fruit, mostly tasted like pork. But it was delicious with sticky rice. Last place I want to post about is Burger Bar, Hubert Keller's restaurant. It's the build your own burger place in Mandalay Bay. Don't get the Kobe beef, it doesn't really taste that different. You can get better tasting Kobe beef at Paramount Room. 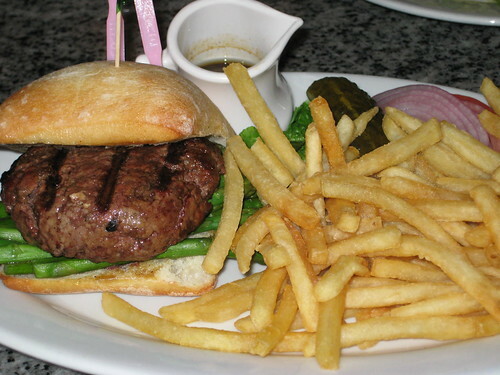 I built my own burger here - Kobe burger with asparagus on ciabatta. The sauce I chose was the truffle sauce from his Fleur de Lys restaurant. It was a good dipping sauce, but tasted more like a steak sauce and not enough truffle flavor. Skip the fries, they were forgettable. I'm glad I tried Burger Bar, but it wasn't all that great. It was expensive, my burger was almost $30. I probably enjoyed my trip to In-N-Out just as much. Last edited by snap203 on June 4th, 2010, 1:20 pm, edited 1 time in total. snap203 wrote: I also just got back from my Memorial Weekend trip to Vegas. Thankfully, I read up on places to eat through this thread before heading out there, so thank you for all your suggestions. By the way, this is my official first post on LTH. I am turkob's wife and have known about lth, but haven't actually written anything until now. I've included only pictures that came out well. Great first post, pictures are terrific, writeup even better. I've not been to Vegas in decades, Lotus of Siam would be one of the main reasons I would go. Far as Peppermill, I have heard it has big portions, but 6 biscuits and gravy plus hash browns is slightly over the top, even for me. Great post indeed. I just ate, but "peas all around" from Guy Savoy really calls to me now. And you made me miss Lotus of Siam...but you really should have ordered the Nam Kao Tod. Spoon has a good version, but it doesn't hold a candle to Lotus of Siam's rendition. It's my favorite dish west of Chicago. Welcome snap203! You and I sat next to each other at the Little Three Happiness dinner a few months ago I think. GREAT post--those PEAS...made me want to run out and check my plants and see if I have any pods yet!! And the thai dishes looked terrific as well. Hope to see you at another event soon. boudreaulicious wrote: Welcome snap203! You and I sat next to each other at the Little Three Happiness dinner a few months ago I think. GREAT post--those PEAS...made me want to run out and check my plants and see if I have any pods yet!! And the thai dishes looked terrific as well. Hope to see you at another event soon. I love how you all pointed out the peas, which was definitely the best dish at Guy Savoy. Where did the photo of the peas go? I want to see the PEAS! razbry wrote: Where did the photo of the peas go? I want to see the PEAS! Third photo from the top. Just got back from Las Vegas again and I hit up many of the usual suspects here. In-n-Out is always my first stop when I get into town. I also went Lotus of Siam for dinner. We were glad we took their advice and made reservations. Even with the recent expansion they were totally full for dinner on a Monday night with the small waiting area packed and many people just giving up and leaving. fish cakes were some of the best I've had. Very fresh tasting unlike the frozen variety served at many Thai places. Papaya salad was terrific and tasted similar to TAC without the dried shrimp. We asked for Thai hot and they delivered both barrels! My wife is a fan of Yum Woon Sen so I was forced to order some. This was my least favorite dish with some nice heat, very fresh, but unexciting. Pictures (especially cell phone) cannot do justice to the roasted duck Panang curry. At the suggestion of the waiter we took the upsell and went for the crispy duck. ($10 extra) While I have some trouble at the concept of paying $20 for a small dish of curry the results were amazing! The duck skin and upper layers of fat were crispy and the meat was cooked perfectly moist. This dish is worth the flight. Lastly we ordered the Northern style sausage from the Northern Specialties menu. Very good garlicky slightly funky sausage that was grilled perfectly. After a two year absence, I'm ready to once again weigh in on my most recent Vegas adventures mostly off the strip. I just got back from a trip and I have a few new places on which to report. I'll start the 2011 edition with one of my two meals eaten on the strip. I landed in Vegas already hungry. I had business at the Mandalay Bay, so I took the opportunity to visit Burger Bar. Burger Bar is a medium sized space that was bustling at 2:00 in the afternoon on a Sunday. I sat at one of the two "burger bars" (there is also table seating) and ordered up a Kobe beef burger (there is a choice of three grades of beef, buffalo (sic), turkey and veggie) with fried egg and caramelized onions along with an iced tea. One thing I liked is that fact that, in addition to raw, they offer both grilled and caramelized onions as topping choices. That's a nice touch. The wait staff, mainly consisting of attractive young women, was friendly, fast and knowledgeable about the menu. I did let my waitress upsell me to the onion rings instead of fries and I regretted that when I saw the fries being served to my neighbors, although the onion rings were decent enough. This was a pretty good burger that was cooked exactly to temperature. Was it worth $35? Maybe. This is Vegas and I’ve lost more than that on a single turn of the cards, but I’ll just mention that there is an In N’ Out not more than 5 minutes away by car. The next day, I started off with breakfast at the Peppermill. I don’t have much to add to what I’ve posted about the Peppermill in the past other than to say nothing has changed. It’s one of the last places you can still go to get a taste of Old Skool Vegas. I was in meetings the rest of the day and didn’t have a chance to eat anything more exciting than hotel banquet food. The next day was a different story. I started out at a place called the Hash House. This is a completely different place than Hash House a Go Go, which I posted about a couple of years ago. That place is still around and now has a branch in the Imperial Palace, if you want an insanely huge breakfast while getting your antique auto and Nazi memorabilia fix. But I digress. Hash House is a friendly little spot run by Mary Rusch who promises “Homemade Midwestern Cooking”. Mary delivers on that promise in spades. Everything is made from scratch down to the jams and jellies. Here’s Mary showing me the day’s jelly offerings. There was quite a selection, too. Choices included grape, strawberry, watermelon, peach, apricot, jalapeno and probably one or two others that I am forgetting. There were so many things on the menu that looked interesting, but I decided to get the namesake hash for my inaugural meal. The problem is, there were so many kinds of hash being offered, I was having a hard time making up my mind. “No problem”, says Mary. “Just order the Super Hash. It’s a little bit of everything.” I was sold and, after discussing the Super Hash options, I had her leave out the chicken and add in some lamb hash. That’s right, you read correctly, in addition to corned beef, ham, chicken and roast beef hash, Hash House serves lamb hash. This was an excellent combination. With each bite, a different taste came through. There was the saltiness of the corned beef and ham, the richness of the roast beef and just a hint of game from the lamb; blended in with just enough potatoes, pepers and onions. The only thing I would change is that next time, I’m going to ask for some jalapenos to be added to give it a little kick. This was one stellar breakfast and a destination worth seeking out during your off-the-strip exploration. They are open for breakfast (served all day) and lunch. Las Vegas isn't much of a deli town, but there are a few places of note. I had heard about a place called Weiss Deli & Bakery that was way out on the southeast side. With a little bit of time on my hands one afternoon, I was interested in checking it out. From the outside, Weiss doesn't look different than any of hundreds of strip mall restaurants in Vegas, but inside, they are turning out food that is completely made from scratch including baking all of their own breads. I decided to order a deli classic; ½ sandwich and a bowl of soup. After a short wait, they brought out a bowl of chicken soup that would put my Bubby to shame. It was brimming with chicken pieces, carrots and a big fluffy matzo ball. The broth was subtly flavored without any added soup base or other kitchen tricks. Although the corned beef is not house cured, it was still pretty good. 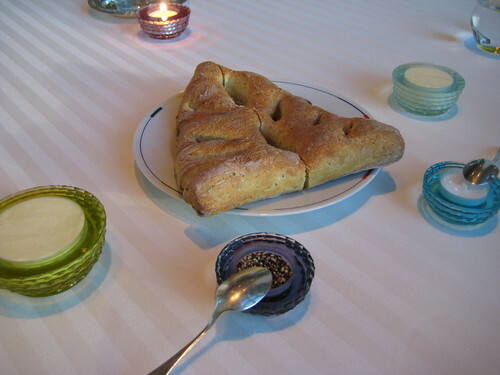 The bread itself was outstanding, the style of which reminded me of Langers. It has a prominent crunchy crust and a somewhat soft crumb, though it’s a bit more substantial than the bread a Langers, which I consider to be a good thing. The loaf itself is massive, and is more wide and oval shaped than your average loaf of rye. The ½ sandwich was served with an outstanding half sour pickle. After lunch, I visited the small bakery section and saw a small, but impressive collection of Jewish style sweets for sale including house baked black & white cookies the size of an Old Fashioned Apple Fritter. Weiss Deli is quite a schlep from the strip. I’m not sure it’s worth the effort to get there, but if you find yourself with some time on your hands and are looking to explore the southeast side of Vegas, check it out. Next up is another meal on the Strip. I ended up back at the Mandalay Bay for a meeting and was feeling a bit peckish, so I headed to the Noodle Shop. On the way, I passed the much more formal Shanghai Lilly’s, which was featuring a 4 course Prix Fixe dinner for $55; a bargain compared to their ala carte menu pricing. I decided to roll the dice and give it a try. First course, Steamed Pork Wontons with Chili Oil. These were made in house and though the sauce was thin, it packed a wallop of heat and flavor. These delivered nicely. I could have eaten at least twice as many of these as were served. The next course was hot & sour soup. When they placed the bowl down on the table, one look gave me a sense that this wasn’t going to be very good. The soup was nearly as thin as chicken broth. There was no hint of thickening as is normal for this soup. I didn’t expect much. Boy was I wrong. This soup delivered on the promise of both hot & sour with explosive flavors that were perfectly balanced. Surprisingly, this was one of the better versions of hot & sour soup I’ve had in recent memory. Things took a decided turn for the worse from this point forward. For my main, I ordered Black Peppered Garlic Beef Tenderloin. With visions of the pungent, flavorful version served at GNR Double Li dancing in my head, and my expectations raised by the first two courses, I was really let down by this dish. It was like sitting at the blackjack table with a pair of kings and having the dealer hit 21 against you. This dish was the most pedestrian thing I ate during my entire trip. The quality of beef was great, but it was covered in an insipid sauce with barely a hint of garlic and perhaps a grind or two of pepper at most. It was like ordering beef and broccoli at a corner chop suey joint. For the dessert course, what else would be more authentic than profiteroles(?). They were good profiteroles to be sure, but profiteroles for dessert at a Chinese restaurant? This was really a head scratcher. I guess the fact that they were filled with banana ice cream made them exotic. This meal was a real mixed bag. I guess my advice would be to avoid this place and, if you’re stuck at the Mandalay Bay with a hankering for Chinese Food, go to the Noodle Shop and keep it simple. In Vegas, you can visit the world’s landmarks, as long as you are willing to do so at a smaller scale than actual reality. There are such wonders to behold as the New York Skyline, the Statue of Liberty, the Eiffel Tower and, most importantly for LTHers, an approximately 2/3 scale version of an Old Fashioned Donuts Apple Fritter. Ronald’s Donuts, located in yet another strip mall in Las Vegas’ burgeoning Chinatown, turns out delicious donuts every day, but their apple fritter is truly a thing of beauty, rivaling the legendary ones served in Roseland. Ronald’s is run by a friendly husband and wife team who constantly make fresh batches of all of their donut varieties. As I said above, the fritters are around 2/3 the size of Old Fashioned’s and around 2/3 as good. They’re made with fresh ingredients and have lots of chunks of apples. Their only downside is that they, along with all of the donuts sold there, are vegan, which I assume means that there is no butter involved. There is a little less richness to the Ronald’s fritter, but not enough less to make me not like them. If you find yourself in need of an apple fritter while in Vegas, I highly recommend a visit to Ronald’s Donuts. They’re open early (or late, depending on your frame of reference while partying in Vegas) with a 4 AM opening time during the week and 5 AM on weekends. One day, I decided to get really, really far off the strip…Area 51 far, that is. The Extraterrestrial Highway is officially Nevada State Route 375 and it runs out into the desert around 90 miles northwest of Las Vegas proper. The highway runs along the border of the infamous Area 51 and there is little to nothing else out there save for the tiny town of Rachel. The Extraterrestrial Highway may be a long stretch of 98 miles with only the small town of Rachel along its expanse, but because of its proximity to the famed "Area 51", fans claim it is one of the most "visited" areas in the country. Officially designated in 1996 for the many UFO sightings along the lonely road, the byway now sports a sign posting its speed limit as "Warp 7" and another sign warning of alien encounters for the next 51 miles. In keeping with the spirit of the road, or perhaps as a nod to its frequent visitors, Rachel, NV is home to the Little A’Le’Inn. The Little A’Le’Inn is little more than a roadhouse shack, but there are some single wide trailers that can be rented by the night, if one is up for some nighttime sky watching. Outside, they boast a flying saucer themed grilling area that wasn’t active on the day I visited. Inside, the place is a single large room with a few tables and a bar/counter for seating. There were 2 – 3 other patrons there during my visit, all of whom seemed to be locals hanging out and having a conversation. While I was there, a couple of German tourists came in and wanted to rent one of the trailers for the night. They were looked at suspiciously by everyone there when they made the request. When I asked the lady in charge if it was OK to take some pictures, her response was, “Take all the pictures you want. Just don’t take pictures of any people because some of them might work at ‘The Installation’”. There is quite a collection of alien-related and right-wing-leaning signs, posters and paraphernalia decorating the room. The ceiling has dollar bills taped to it where visitors have signed their names and home towns. Little A’Le’Inn has all the ambiance of the kind of place you might stumble into if you were cast as a victim in a horror flick. Of course, I had to order the Alien Burger. According to the menu, it’s “Out of this world”. The burger is an oblong shaped affair, served on a torpedo-like roll (think Gonella) and topped with thick cut American cheese. You get your choice of slaw, potato salad or chips on the side and I opted for potato salad, which they make in house. Sadly, the burger wasn’t very good. It was pure food service grade beef, cooked into dry oblivion. The potato salad was decent, though. It’s a long drive from Las Vegas to the Little A’Le’Inn, and it requires planning to make sure you don’t run out of gas before getting back to civilization. I’m glad I went, but it’s not the kind of place that I would recommend going out of your way to visit, unless you’ve got an extra day to kill and absolutely nothing else to do. Oh, and about those aliens. I’m not sure I saw any, but this guy was waving good bye as I left “The Installation”. nice reports on your recent visit Steve, I am enjoying reading about the places you visited alot. After communing with aliens, I headed back to Vegas for a visit to the spa and dinner at the well-loved Lotus of Siam. I’ve been going to LOS for a long time, and I’ve posted about several meals in the past, so I won’t go into a lot of detail this time, but here are the main points of this visit. First of all, since my last visit they have expanded into the storefront next door increasing the capacity of the restaurant quite a bit. They have also added a bar and an impressive walk in wine cellar to house the bottles from their extensive wine list. With the expansion of space, things have changed a little bit at the restaurant. Most apparent is there are a lot more white people eating dinner there, many of them attending conventions and probably trying Thai food for the first time. As a result, the spice levels have been dumbed down considerably. As many of you know, I love spicy food. The hotter the better in most cases. In the past, ordering anything past level 8 (they use a 1 – 10 scale of spiciness) was too brutal, even for me. This time, level 8 packed some heat, but not much more than enough to give me a little tickle. On previous visits, that level would cause me to break a serious sweat. Having said that, the food is still very good, but you need to adjust your spice level ordering accordingly. Usually, I start out with an order of their spicy chicken wings, but this time I took Dave Feldman’s recommendation and gave the Garlic Chicken Wings a try. Sorry Dave, I won’t be ordering these again. They were dry and one note. The fried garlic on top was very good, but none of its flavor managed to penetrate the wings themselves. I had to ask the waiter to bring me some dipping sauce because on their own, these wings had been given a serious flavorectomy. Next up was a cup of Tom Kha Kai. LOS’ version is somewhat unique and very good. The soup is very well balanced and contains lots of chicken and black mushrooms. 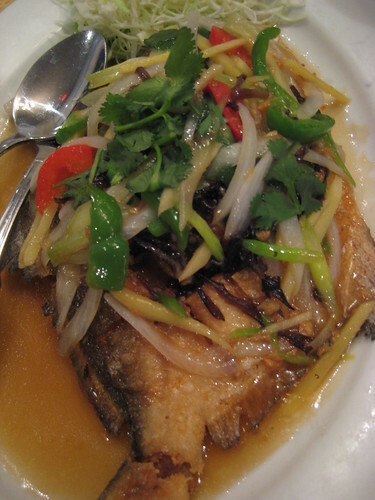 It’s topped with a dollop of chili oil, which gives it a nice, distinctive taste. They also serve a Northern version, which doesn’t contain any coconut milk, but this is the version that I prefer. Looking through the Northern Thai menu, I found something called Crispy Duck with Chu-Chee. Since I am presently having a love affair with GNR Aroy Thai’s Chu-Chee Pork, I was sold. 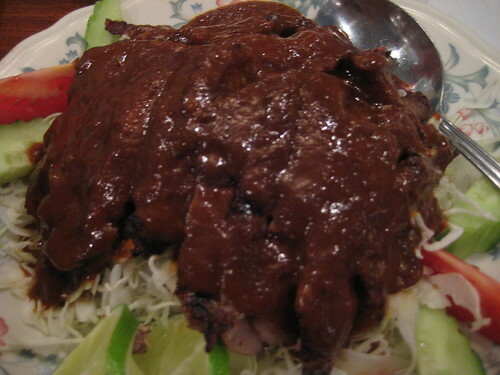 This dish is actually nothing at all like the dish served at Aroy. Instead of the bolognaise-like presentation served over a fried egg, this dish was more like a red curry duck, although the same chu-chee flavor notes were present. The duck skin itself is as crispy as shards of glass, but much more tasty. It was expertly deboned and perfectly cooked. Other than wishing it was a bit more spicy (see my notes above about spice levels), this was an outstanding dish. Dessert was my usual order of coconut “ice cream” over sticky rice, served in an ice cream sundae dish. 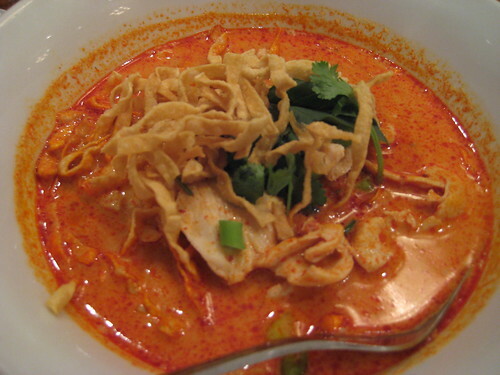 Lotus of Siam remains one of the country’s premiere Thai food destinations. In Chicago, we are blessed by an embarrassment of riches when it comes to Thai dining, so a little of LOS’ specialness is lost on me. If I lived elsewhere, a meal at LOS would always be at the top of my must do list. Still, I try to make it a point to visit any time I’m in Vegas. I really loved the garlic chicken wings when I had them (although they were, as you say, somewhat one-note). But then I made the mistake of having them for lunch and then getting on a flight back home... I don't think the people in the seats around me were very happy about that. gleam wrote: I really loved the garlic chicken wings when I had them (although they were, as you say, somewhat one-note). But then I made the mistake of having them for lunch and then getting on a flight back home... I don't think the people in the seats around me were very happy about that. Maybe I got a bad batch. They were really slamed when I was there. With my Vegas trip coming to an end, I had my last breakfast in the last known place of employment of the late great hungryrabbi, R.I.P., Baglemania. If you weren’t around LTH back in the day, you missed some of the funniest writing this forum has ever seen. Click the link to see his farewell to Chicago post. It’s a nice walk down memory lane for those of us fortunate enough to have known Evan. But I digress. A breakfast at Bagelmania has become something of a tradition for me, and one I can safely recommend to anyone else looking for a breakfast of freshly baked bagels accompanied by your choice of nearly any dish in the Jewish breakfast encyclopedia. My usual order is the lox plate for one. This is a nice sized portion of lox and all the accoutrements, and is easily enough to feed two people if you order an extra bagel. I also request a few slices of Munster cheese on the side and they are happy to oblige. I’ve posted about this place upthread, but it remains a very satisfying breakfast on the way to the airport, and a nice place to pay respects to hungryrabbi’s memory. As I mentioned the other day, my wife and I recently returned from several very good days of eating in Las Vegas. I covered our Strip meals here. In this post, this thread, I'll cover off-strip. I'll say right up, that as much as we enjoyed our Strip meals, we enjoyed even more, our off strip meals, and I would offer Ichiza as my favorite restaurant so far in 2011. Our first off-strip meal, our first dinner of this trip came at Raku, the especially notable Japanese place sharing the Spring Mountain spree of ethnic eateries. Raku has a high reputation as a place for Las Vegas chefs to eat late-late. Because of its renown, reservations are considered a must. Well, we thought who needed that advice on a Monday night, in the summer when the temperatures still resided over 100. And we just skated by, getting the last available table, and probably the last available table for a while. Thank God. Our foolishness was rewarded with some of the best, if not the best Japanese food we've ever eaten. Raku is not an expensive restaurant by the price of most dishes (except as I'll explain in a second), but it is a menu of so many exquisite choices, you can easily run over three figures for a party of 2. The menu contains a lot of standards plus the offerings from the robata grill; then, they bring the chalkboard over with the specials of the day. You want to get nearly all the specials, but especially, man especially, get the house made tofu. I might just start a thread of the existential question of how Raku tofu can be so much better than any other tofu eaten, including several other "artisan" tofus. Seriously, I am not sure what one can do to make it this much better. We got the tofu half-and-half, which meant, one half cold, to be eaten we were instructed, with the house green tea powder, and the other half fried (agadashi) and served in a broth. The fried carried a great two-tone texture, but the plain carried even more the character of superiority. The other great dish of the night, the one that actually cost a bit, $25, was the broiled yellowtail collar. One feels like Tony Bordain reveling in the deliciousness of this odd cut, but it really did exceed a simple fillet. 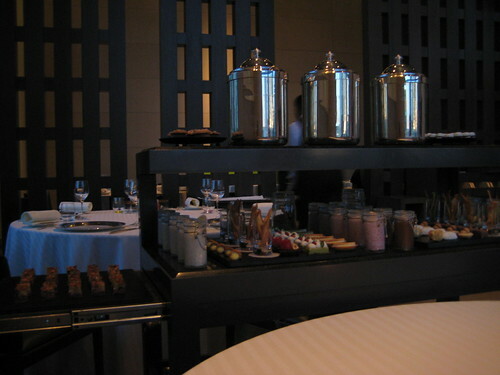 Don't ignore the robata grill though as we liked the items there too. Still, if Raku represented immense talent, Ichiza, dinner the next night, represented effort, and sometimes, Charlie Hustle scores more. Ichiza is a Japanese diner, being the Asian equivalent of the 100+ men, olive burger, Greek diners, we find around our area. In fact, I would suspect amidst the many wall papers of items for sale at dinner at Ichiza, one might even find an olive burger. I mean there were mozzarella sticks and chicken wings, and just like TGIF, tempura battered green beans. Who gave who the idea? The host, presumably the owner, explained to me that certain customers ate at Ichiza several times a week and they had to keep the menu a-changin' to prevent boredom. A good deal of what you will eat at Ichiza, I suppose is based on where you sit, because you can mostly only order from the specials near your eye-view. Ichiza is papered with specials. Daily specials, weekly specials, new menu items, items on the all for who knows. You are inundated with menu. The choices overwhelm, and just when you think you've settled on six of so dishes, you see more things that call out. Should we get the kobe carpaccio or the yellowtail carpaccio? The people around you influence your choices too, and the four Asian woman who put away so much more food than their size suggested* stirred us first to the tofu sashimi salad, a brilliant choice, who knew and the lemon stuffed with sea urchin. Thinking about our dinner, I think only one dish was "cooked", at least warm, that would be the jalepeno fried rice. Everything else was cold: spinach, buckwheat noodle salad, the yellowtail carpaccio and the other dishes mentioned. For dessert, we did not join the girls, and most of the house, with the honey ice cream--an odd but brilliant concoction of hollowed out Japanese white bread (if you've shopped at say Mitsuwa, you know this bread) filled with ice cream and honey. "Japanese bread pudding," they called it. Maybe next time when we had more tummy room. I have to say, the coffee jello with fresh whipped cream really hit the spot. The last off strip meal, brunch after hiking the Red Rock, dim sum at Harbor Palace. It had a very Hong Kong look from the outside, a room filled with Chinese, and an array of pulled carts, but I would say that it only produced good dim sum. Put it this way, it is not vacation food, where one is looking for stuff better or different than at home. We were too early for the place we wanted, where we should have gone, the Japanese ramen shop, Monta. I really enjoy the food in Las Vegas, as much, actually more, for what is off-strip than what is on. Note, all of the places discussed our in strip malls and can be easily missed when zooming down the street. Pay attention. I also add, that these places barely scratch the surface of what's out there: Yunnanese, Thai noodle, Korean bbq, Hawaiian plate lunches, it's a real full buffet around Spring Mountain. *"Asian woman can eat," we were told "but not drink" - Our next door neighbors at least demonstrated one. Vital Information wrote: You want to get nearly all the specials, but especially, man especially, get the house made tofu. I might just start a thread of the existential question of how Raku tofu can be so much better than any other tofu eaten, including several other "artisan" tofus. Seriously, I am not sure what one can do to make it this much better. Thanks for the tip on Ichiza and Monta--will have to stop by on my next trip out to see the folks. Spent half of last week mostly off-strip in Vegas, visiting my parents, and had the opportunity to check out a couple new-to-me places. We went to the Strip one night, but I wrote about that in the Strip/Downtown thread. On our first night, my dad was excited to take us to T-bones Chophouse at their local casino, Red Rock Casino. The name didn't scream class or quality to me, and I've been less-than-impressed with Red Rock's buffet in the past, so I went with low expectations. Much to my great pleasure, it ended up being a "don't judge a book by its cover" sort of evening. We started our meal with a round of drinks, including a perfectly respectable Ketel One dirty martini for my wife, and a classic Tanqueray martini for me. Their liquor selection wasn't very impressive, but I got the impression that their primary focus is wine. Next we had the rock shrimp tempura and the seasonal heirloom melon salad. The shrimp tempura was well made, with light, crisp, non-greasy coating and properly-cooked chunks of shrimp. The melon salad was excellent - crisp chunks of piel de sapo melon, fresh, non-wilted arugula, very nice jamon serrano, and micro basil, drizzled with lemon oil and given a bit of a kick with some crushed red chili. We enjoyed this enough that we just recreated it at home (subbing the lemon oil with lemon juice, and the "micro basil" with some really tiny mint leaves) two nights ago after I spotted ripe piel de sapo melons on sale at Whole Foods. For our mains, my dad had a 12oz filet and my wife had the 8oz petite filet, both of which were cooked exactly to the medium they ordered, and were as tender and lightly beefy-tasting as any filet could ever hope to be. I, however, opted for the 35-day dry-aged 18oz bone-in filet. This steak was just awesome. Perfectly medium rare, richly beefy, tender...it was so good, I mostly ignored our sides and went to town on this steak. I was also pleased so see that there wasn't so much as a drop of bloody beef juice on any of our plates - all of our steaks were served piping hot, yet had obviously been properly rested. With our steaks, we had potatoes au gratin and sauteed Royal Trumpet mushrooms. Both sides were very good, but I only tried a spoon or so of each...didn't want to distract from my steak. Service, from when to walked in to when we walked out, was professional, friendly, and helpful. Prior to this dinner, Jean Georges steakhouse at the Aria on the Strip was one of the better steak dinners I'd ever had, certainly the best I'd had in Vegas. I felt that T-bones was on par with that, in terms of food & service. However, it was also on par with Jean Georges in terms of price...fortunately, dinner was comped for us (my dad loves blackjack, plus all the casinos have been showering locals with comps lately). The next day, we had dinner at Raku, which I'd never have found were it not for LTH - THANK YOU ALL! This place was amazing. We stuck with robata grill items: chicken thigh, Kurobuta pork cheek, yellowtail "with glazed soy-based sauce", mushroom, shishito pepper, and Kobe beef filet with wasabi. I loved the shaved bonito on the shishito peppers, and could easily have scarfed down a pile of the juicy, slightly fatty, perfectly salted, lightly crisped chicken thigh skewers - they're the perfect bar food! The yellowtail was really good as well (though I didn't care for the pile of mushy shaved white something or other that came with it...daikon? ), and the pork cheek was a surprise - I didn't expect it to be mostly fat...but it was cooked so well that it ended up being a unanimous hit. But the Kobe...oh, the Kobe! The flavor was very delicate-yet-beefy, the grain of the meat was so tiny it was almost invisible, and these tiny skewers were cooked more perfectly and uniformly than any steak I've ever seen - the outer 1/16" was seared to a nice crust, and the rest was exactly medium. I bet that if I had pulled out a Pantone color chart, it would have confirmed that every part of every morsel save for the crust was the same shade of pink. Because of these Kobe beef filet skewers, when the waiter recommended wagyu something-or-other at Bar Masa the next day, we had to fight to keep our scoffing to a minimum. I can't wait until my next trip to Vegas - I'm going to do some damage at Raku again. It might seem darn crazy to have just finished a fourth trip to Las Vegas in calendar year '11, but this is my happy place. Happy, especially for the food. In this just completed trip, my first visit there with the kids, we actually ate the bulk of our meals off-strip--our few strip meals, I'll post on them in the Vegas, Special Occasions thread. On this trip, we re-visited our favorite (previous) meal of 2011, visited the noodle shop we had been keen on trying, and visited some oddball "finds" that could easily make it to Vegas GNR status. We arrived early on Christmas and hightailed it to Ceasars' Palace for Payard's lavish buffet of French breakfast pastries. Stuffed for a bit, this left us with our next activity of the day, figuring our Christmas dinner. The competition narrowed to Rao's Italian fish dinner and Michael Richard's Christmas fete at his newly opened Central Las Vegas. Needless to say, somewhere between all those croissants and the decision*, we found ourselves peckish. Ramen noodles seemed the antidote. As I've mentioned upthread, the noodle house, Monta, has been on my shortlist of places to try. And try we did, although I have to confess that I have none of the ramen insights that imbue some of the posts on this item around here (and there). I have no nuance. Nor did we, even, or especially, know what to do with the condiments, the containers of garlic and pickled ginger, the vial of chile powder. We were slapdash for sure. So, you'll have to take it from someone who does not know what they are talking about to say that it was very, very good**. And I mean all good from the little plates of kimchee on the side ($1!) to the soft, rich pork, to the, my god, hard boiled eggs. Again, I'm hardly an expert on Japanese food, but I'll the you, there are (at least), two things Japanese restaurants do better than anyone: hard boiled eggs and tofu (see below). The main plan for the following day was the un-Chicago like, Red Rock Canyon. We knew we'd encounter interesting chow. It turned out to be, I'll say, more interesting than I expected. If you have driven Las Vegas, particuliarly the area just off the strip, you know that the city's grid rotates about 30 degrees on its axis. Thus, Paradise Road, a half-mile east of the strip, eventually meets up with the strip, and it meets up right at that point where neon ends and the pawn shops begin. We were on our way to Charleston Road, the outlet to Red Rock and getting hungry. Something Asian was what we probably had it mind, but espying the White Cross Drug Store reminded me of some notes I had of a old fashioned counter within a drug store. A check of the phone, and sure enough, this was it. This is breakfast at Tiffany's (the name of the place). Listen, this is not a place that will get much play on the Local Beet. Nothing farm-fresh here. Still, in the way that a grease stroked grill and years of practice can sometimes do, it all worked so well. There was pretty decent ham off the bone, quite fatty; and potatoes cooked to order on the flat-top. Besides, the filling, not so expensive breakfast, the drugstore itself is a time-warpy attraction too. This was place one I'm a bit surprised we had not seen a SteveZ post yet (who, perhaps, can come and take better pics). This was can't believe SteveZ has not been here yet place two. This sign caught our eye on the road to Red Rock. And, really, as tempting as it looked, it was more a combination of factors (not important to this telling) that brought us here on the way back. I keep on wanting to say, it tastes like Chicken Unlimited, but I have no idea what Chicken Unlimited actually tastes like. I remember going there. I just don't remember what it tasted like. But it had to be what Farm Basket tastes like, right. It's just that Farm Basket tastes old. Not old as in sitting around, but old as in some ancient recipe. According to our cheerful counter-gal, Farm Basket may have been a chain at one time, with California locations--it just seems like the kind of place that would be in the LA area. There was juicy fried chicken, heavy with a 15 herb and spice type of seasoning (abet crisper than the Colonel) and fried chicken taquitos that tasted equally anachronistic. Having not seen enough of the other side of Vegas, we ventured out the next day to the Hoover Dam. One of the fun parts of the trip is passing through the un-Vegas, Boulder City. This place, built to house dam workers and not house temptation for Dam workers is more like a faded town along Rt 66. We found several places seeming worth a late lunch, after the dam. We got kinda lucky here. Of the several interesting looking places we saw on the way in, the one that called out to most on the way back was the "world famous" Coffee Cup because of its big, vintage, neon side. Still, now safely home and seeing the Guy Fieri soaked website, I'm glad it was closed when we attempted lunch. Instead, we visited Star Burger. This WAS my favorite meal of the trip. I could spend a whole post on the virtues of Star Burger from the Wiv-crisp toasted bun, to the secret Star sauce, the house made cole slaw, and the odd choices of kobe or kilbasa burgers (although we got neither). This was exactly what you want in a roadside burger stand, and the fresh-cut curly fries only gilded the lily. We took the kids to one place from our summer visit. *** I forgot to get my response in to Steve Plotnicki's best meals of 2011. When I did, I told him it was Ichiza, the Japanese diner I talked about up-thread. This was our last meal of the trip, and the combination of many hours awake, lots of running around, and resignation of a trip soon over made this meal not quite as best of as the June visit. Still, this is one of the leading restaurants in Las Vegas. And no dish is finer at Ichiza than the tofu salad. For one thing, who thinks tofu salad also comes with a huge portion of tuna sashimi. For another, as noted, man can they make tofu. The biggest chore at Ichiza is picking from the hundreds of daily, weekly, new, old, what they hey, sheets, wall scribbles, table notes, and such, menus. We also got that octopus mcnugget thing that's so crazed in Japan, with mayo and brown sauce, some pork belly in broth, another example of well-cooked hard boiled egg, the yellowtail carpaccio, and tempura over rice for the unadventurous kid. When we found ourselves not full, we added a bowl of clams with butter and garlic, which was exactly as it sounds. We could not finish, however, where we wanted. Adding to the bittersweet nature of this meal, one of our main, wanna tries, the hollowed out, "honey toast" was 86'd for the night by the time we sat down. Going soon to a red eye, we skipped the dessert we loved last time, the coffee jello. Another good account of Ichiza can be found here. See why this is such a happy place? **In between starting and finishing this post I gave a try to Slurping Turtle. While I'm no way a ramen maven, I can surely now put Monta well above this place. ***My wife and I also took the kids to the Wynn buffet this trip, but that place was not part of our summer trip. stevez wrote: Weiss Deli is quite a schlep from the strip. I’m not sure it’s worth the effort to get there, but if you find yourself with some time on your hands and are looking to explore the southeast side of Vegas, check it out. This place was about 3 miles from where I lived in Henderson, and it's one of the few places I really miss out there. Although it's about as good as it gets deli-wise in Las Vegas (with Heidi's being the only other, if non-traditional, contender), that wasn't what made me go back. Everything else on the menu is great, and I almost always went for one of the specials. 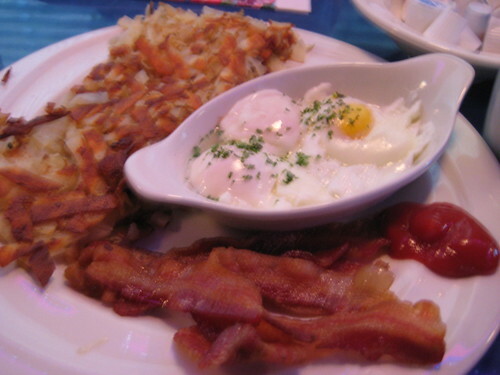 It's something that is largely missing in Vegas; well made, simple, mom-and-pop diner food. I'm surprised nobody has hit Rosemary's on Sahara before the unfortunate closing. One of the very few 100% local fine dining options. The clouds in my dreams have been replaced by floating versions of their sweatbreads. At Lotus of Siam, Kang Hung Lay, northern pork curry stew eaten with sticky rice, was always one of my favorites, although I tried my best not to order the same things in an attempt to cover most of the menu. The flavor is excellent, and there is plenty of sauce to soak plenty of rice, although if you do not like bony and fatty cuts of pork, stay away. For me, this one is more about the rich flavor of the sauce. I hit Rosemary's for lunch a couple years ago and was incredibly underwhelmed. Maybe they were better for dinner, or maybe they just weren't very good anymore. 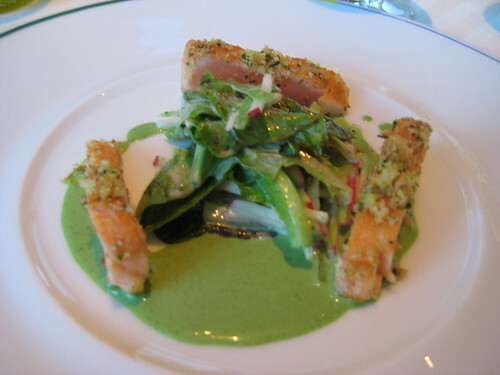 gleam wrote: I hit Rosemary's for lunch a couple years ago and was incredibly underwhelmed. Maybe they were better for dinner, or maybe they just weren't very good anymore. Never went for lunch, but I was never disappointed at dinner (between late 2007 and early 2009). I second gleam. visited in Oct of '08. It's like French food for visiting townies and local septegenarians. Freakishly tired room, equally boring food. It was rec'd to me by a woman with a slutty mouth who thought everything was "AMAAAZING". At least there was a Restaurant.com coupon. Maybe it was amazing when they started, before the food world cared about Vegas, and vice versa. Man, that is a perfect description of the food. I do not have the energy for a three or four page review of all of the places we tried last week. However, here are some brief reviews of the non-Strip places that we tried out. In-N-Out - Tropicana It has been a few years and we were not real hungry last Saturday night. The hamburger was quite good, not the BEST I have ever had but well worth the money. However, since we ate in, I really got a good look at the fries. In the 6 oz I received, I doubt if I had more than 2-3 fries longer than 2 inches. They were all tiny. And the milk shake was NOT very good - not even in the McDonald's class. Hot and Spicy Crawfish - Spring Mountain I found this place a few years back before it was famous. Well prepared seafood - shrimp, crawfish, etc. WOW, the prices are much higher but the quality is excellent. If you do not like shrimp with heads on (like my SO) don't order the shrimp. Ellis Island - Korval This was my third steak at this place and this one was simply the toughest piece of beef that I have EVER had. I almost started chewing my shoe for comparison. Hooter's Steakhouse - Tropicana Well, the steak was free and other than the first bite, was quite good. The baked potatoes and green beans were excellent. Johnny Smalls - Hard Rock Hotel Best meal of the trip, hands down. They have an AYCE small plates format or an ala carte set up. For $19.99 with players card at dinner, they keep bringing you plates off of a pretty creative and expansive menu. The high points were the "Smalls Balls" - risotto and short rib balls with a marinara sauce. The plate of cured meats was also quite excellent. The flatbread was also quite well done. However, the best dish was a bacon wrapped date stuffed with an almond. The guacamole was completely forgettable. Lee's Submarine's - Spring mountain This is a chain that features a wide variety of bahn mi sandwiches and European sandwiches ranging from $3.95-6.95 for a 10" submarine. The pork pies (thing British) are also quite good. Open 24 hours. M Hotel Casino - Far south of the Strip One of the better buffet meals that you can have in the Las Vegas area. It is a place that all the locals swear as the best and one that gets little press. The desserts are the high point. We sat out at the pool for an hour as it was so quiet and relaxing. While not restaurant related, the most interesting food experience that we had was watching the date harvest at the China Date Ranch in Tecopa Springs, CA. It is one of the few commodities where the owner of the orchard actually cuts down the bunches of dates. It was fun to watch them harvest about a quarter ton of dates in little under an hour.